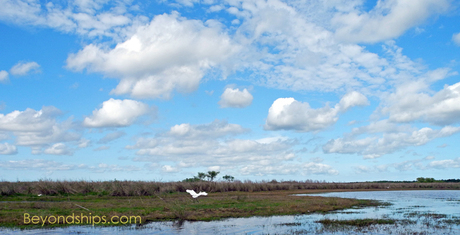 Above: The Lone Cabbage - - the point of departure for the airboat expedition. Above: The river meanders through the wetlands. 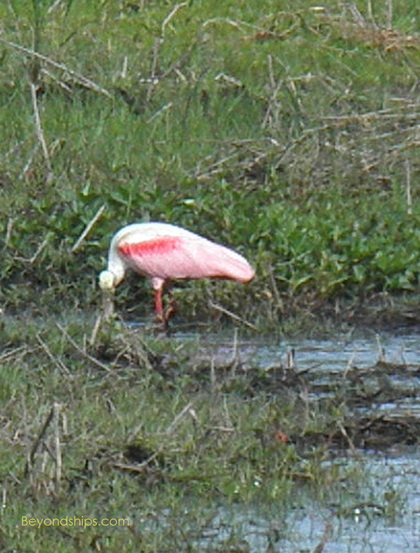 Below: A variety of large birds were feeding on the banks. Alligators were all around us. The fresh water expedition was quite different. Whereas the salt water tour had been a peaceful, laid-back day out, the fresh water tour was fast-paced with a feeling of living life on the edge. Airboats are a Florida trademark. One of my earliest memories is of a television show where the ranger/hero would zip through the Everglades each week on a craft with what looked like a giant fan on the back providing the propulsion. 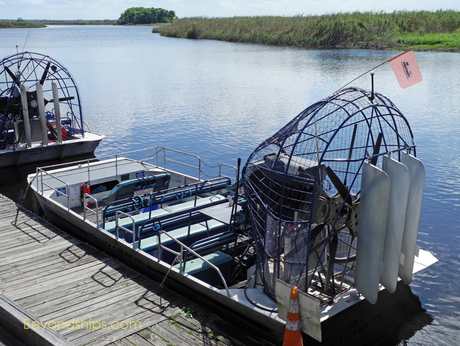 Whereas that craft was designed for one person, the airboats that are used for tours generally have a few rows of benches in front of the driver’s seat. His seat is higher than benches and is immediately in front of the cage that encloses the propeller. Driven by an automobile engine, not only are airboats fast - - they can achieve speeds of 40 miles per hour - - but they are highly maneuverable, capable of making very sharp turns. Moreover, because the propulsion is above the waterline, these light flat-bottomed boats have a very shallow draft. The captain who drove the boat I was on said that his boat was able to travel with as little as a half inch of water under the hull. 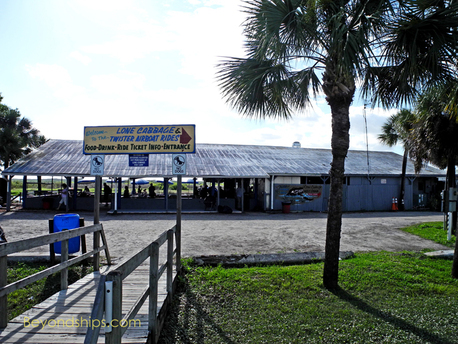 In order to get to the airboats, we had to travel further inland than we had for the pontoon boat tour. It was a half hour bus ride to the St. John’s River, the longest river in Florida, our guide told us. While the river is quite wide by the time it reaches Jacksonville, it was only about 20 yards wide here. We stopped at a riverside roadhouse. A section of the parking lot had a sign that indicated that it was exclusively for parking “bikes.’ The large motorcycles parked there made clear that the sign was not talking about the Tour de France. Inside, several bikers took no notice of the tourists. In back of the roadhouse was a wooden pier where several airboats were moored. 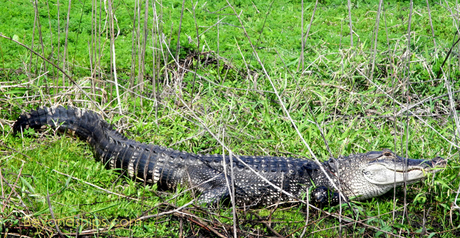 There was no question of whether we would see a wild alligator on this tour. 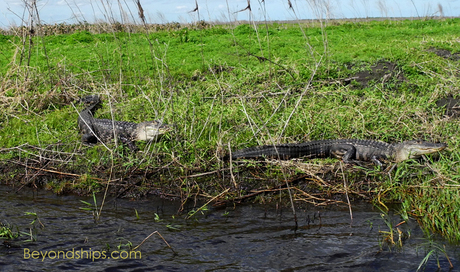 Indeed, we saw one even before we boarded the airboats. 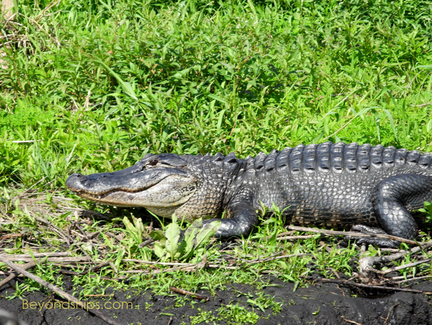 A few yards down the river, a medium-sized alligator was lying motionless in the afternoon sun. Since each airboat only carries a few people, the tour group was divided up amongst the airboats. Upon boarding, we found noise canceling headsets on the backs of the benches. The reason for these soon became apparent - - a loud roar issued from the airboat’s engine as the captain got it underway. However, it was not so loud as to obscure the captain’s narration, which played over the headsets. Along the same lines, it is a good idea to wear a jacket even on a warm day. When the boat gets up to speed, you can have a 30 to 40 mile an hour wind blowing directly on you. Another precaution is insect repellent. This is a voyage into the type of environment where insects thrive. While insects are less of a concern during the winter months, it does add a layer of protection. After going under a highway bridge, the airboat began to pick up speed. The engine roared louder at the craft skimmed across the water. At this point, the St. John’s River meanders through reed-covered fields. Consequently, the airboat had to make sharp turns, banking steeply as it turned the corners. The depth of the water fluctuated. Nevertheless, we sped across the surface without differentiating between dark, seemingly bottomless pools and areas that were little more than wet ground. This ride would have been a great experience even if we had not seen any wildlife. But along the way, we again saw herons and other exotic birds. A long snake swam across the river in front of us. On the banks, longhorns and other half-wild cattle stared at us without expression. The highpoints, however, were the alligator encounters. 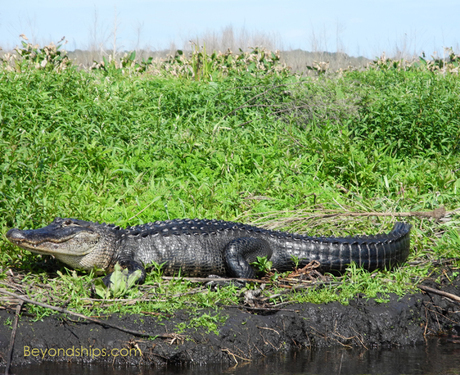 Spotting one on the bank, the captain would slow the airboat and maneuver over to the motionless animal. Coming within a few feet, we were staring eye-to-eye with a creature that has changed little since the days of the dinosaurs. There was no mistaking the tension as these animals observed us muscles taught. 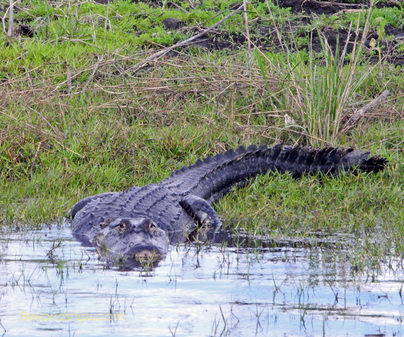 Someone asked “how quickly can they move?” As if on cue, the alligator that we were watching sprang to life and in an instant he had gone from the riverbank and disappeared into the black water next to us. We must have had five such encounters in the space of a 20 minute ride. Coming so close to these sinister-looking aquatic carnivores combined with the exhilaration of the airboat ride made this an adrenaline-pumping experience.